As our apartment slowly fills with Amazon boxes, I wonder if Sustainable Mom actually stayed in the country with Sophie and the snow blower. After a year back in New York, I am finding it difficult to live lighter in this mecca of conspicuous consumption...especially around the holidays. Although I bought a few decorations for the tree at the Hong Kong airport, decorations are better made and not bought. Since the Freen has been old enough to make art, I've been trying to save anything with a holiday theme and use it each year and now at five we've started to accumulate quite a bit. Even if your child goes to a school that refuses to give them a Christmas tree to color, you can use non holiday themed projects from the past year to make a collage on red or green paper. If you are not lucky enough to have your own Kandinsky or if you prefer more traditional fare...Global Goods Partners has a great selection of silk ornaments including a Christmas tree and a Dove. Etsy also has great selection my favorites include the Bicycle Tube Snowflakes and this tin Christmas Tree. According to Treehugger LED Christmas lights use 80% less energy than regular lights and last ten years or more. I have also read that like regular lights you can get bad batches which at the premium price can be frustrating. I didn't buy them this year only because I had some regular lights from last year left over and I wasn't sure about mixing. Regardless, for a single tree it may not be worth the investment, however if you are lighting the outside of your 7 bedroom colonial from top to bottom or a tree lined city block they may be worth the investment. There is a lively debate online between real and fake trees but most agree that if you can have a potted tree this is your most eco-friendly option. We got ours at Stew Leonard's who tries to make you feel better about the freshly cut tree by printing on the tag that for every tree they sell, another one is planted. I have to imagine any self-respecting tree farmer does this since it takes seven years for a tree to become full grown, so while it helped allay any twinge of guilt as they tied the tree to the roof, it isn't much more the green washing by our everyone's favorite dairy farmer. That said, I can't with good conscience even engage in a debate about a fake Christmas tree because personally I would just opt out before bringing a fake tree into my home during the holidays, so all I can say is that if it is practical for you buy a live tree and plant it, do that. If not, then focus on recycling your gift wrap. Alternatively consider these other interesting albeit time consuming options. 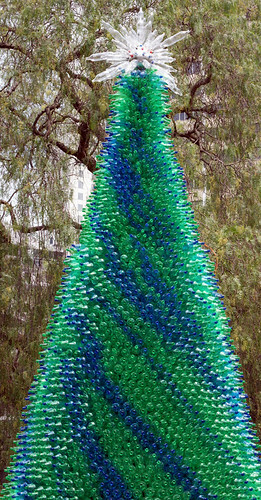 My personal favorite, a Christmas Tree made from plastic bottles. 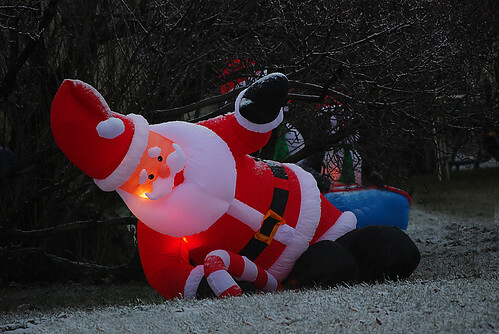 and by all means skip the inflatable plastic Santa for goodness sake. Around 125,000 tons of plastic packaging are thrown away over the holiday season. Take your own reusable shopping bags when you do your shopping. Make it yourself. If you have skills and time use them. Nothing is more special than a gift made by a loved one. My mother in law is talented at knitting, quilting and cross stitch and we are lucky enough to have a hand quilted Christmas tree skirt, personalized Christmas stockings and an Angle for the top of the tree so even though she can't always be here for the holidays we have her to thank for how warm and inviting our home looks around the holidays. 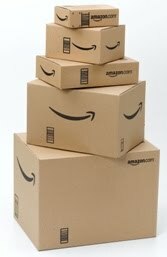 Keep it simple with one large gift instead of lots of little gifts. This is a tough one for me as I still equate how good a Christmas is with how long it takes to get all the gifts unwrapped. I've been known to wrap things that I've already used just to have more presents under the tree. Shop locally from small merchants. When buying presents, keep an eye out for those with minimal packaging, or items packed in recycled or recyclable materials (e.g. cardboard). Another good choice is a Global Exchange fair trade store. Give a gift certificate for your time - child sit, or pet sit. Offer your talents, such as photography, financial planning, or hairstyling. Make dinner for someone or cook and deliver it to them. Give an experience such as tuition for an unusual class. For kids, consider giving an environmental excursion, like a whale-watching or camping trip. One of the best gifts I received in sometime was an Epicurious Tastebook. My mother in law made one for every woman in our family and it was a collection of all of our family recipes. Collect photos and put together a photo album. Make a calendar for the coming year using your own photographs. Give the gift that keeps giving a Community Supported Agriculture membership - Visit the Local Harvest site to find a CSA near you and purchase a share for a friend or family member. Buy recycled wrapping paper, vintage or use Lucky Crow gift bags which offer a sustainable alternative to disposable gift wrap. Reuse boxes when I packed up Christmas last year, I saved almost every box, ribbons and and reusable tags. Buy cards made from paper and without lots of added decorations, as these cards cannot be recycled or just go electronic. Then be sure when celebrating and entertaining buy organic, local and seasonal foods and avoid non-recycled disposable serve ware. Wishing you and yours a Happy Healthy Sustainable Holiday Season!